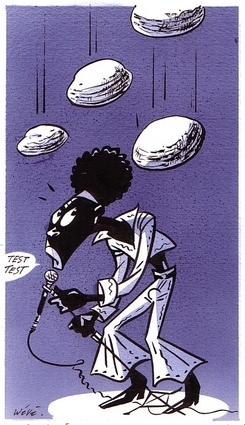 Talking about exotic Soul records: this is a drawing that Willem Vleeschouweronce made for me after I played him the LP by the Surinam band The Falling Stones (Back to my People). I am a huge fan of soul music made in exotic countries like Barbados, French Guyana and Caribbean islands. Since Holland once had some colonies in that area, there are quite some nice records to be found here from counties like Surinam and The Antilles. And some of these records are real good!